While laying the blame firmly at the feet of entertainment companies for failing to keep pace with technology, the recently appointed IP advisor to the UK Prime Minister says that should education and new products fail to have the desired effect on illegal downloading, ISPs should be held responsible for their users' actions. Early September UK Prime Minister David Cameron appointed a brand new intellectual property advisor. 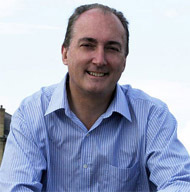 Conservative MP Mike Weatherley, a former record label worker and Vice President of the Motion Picture Licensing Company, began with a brief to focus on intellectual property enforcement issues relating to the creative industries. With the appointment of Weatherley, a chartered accountant and former finance director of record producer Pete Waterman’s empire, there can be little doubt that the Government is looking to tighten things up on the IP front. Writing for the World Intellectual Property Organization magazine, the 56-year-old says that he faces a key question of whether the solution to the piracy problem requires government and/or industry involvement, or a partnership of the two. Weatherley begins by touching on the complex issue of content licensing and the domestic issues raised by the Hargreaves Review. However, he soon moves on to what many believe is one of the main drivers of infringement over the past decade – a failure by content distributors to move forward with technology. “At the end of the day, the creative industry must take responsibility for its failure to keep pace with the digital age. Technology will always open up new ways to access content. If creators do not begin to embrace these technologies they will lose out, and by default, the market will be dictated by ‘open rights’ interest groups. The creative industry alone is responsible for not evolving fast enough. The music industry, for example, has spent years saying ‘no’ instead of ‘how?’,” Weatherley says. “In 2010, at the UN Worldwide Internet Governance Forum in Vilnius (Lithuania) it was shocking to see that no one from either industry or government was present to make a case for supporting the protection of IP rights. The Pirate Party, however, was there in full force arguing that all content should be made available for free,” Weatherley notes. Echoing growing sentiments of many in the digital domain, the MP says that the “efficient and plausible way forward” would see the industry not only educating consumers but meeting their demands by offering “simple, affordable and legal access” to copyright-protected works. “Proponents of piracy say downloading content legally is too complicated. Industry, therefore, needs to find innovative ways to ensure that content is easily available and in so doing make piracy a less attractive option. We need to let go of old dogma and identify and further develop new, workable solutions, Weatherley says. But what if education plus fresh and innovative offerings can’t do the job of seriously reducing copyright infringement? Legislation can, it seems. “Government must back up industry by putting the necessary enforcement mechanisms into place. This would include holding Internet Service Providers responsible if they knowingly facilitate illegal downloading practices and do not take steps to stop this form of piracy,” the MP states. The issue of liability for third-party infringement has been well-trodden in the past 12 months, with both the music and movie industries taking the leading ISPs to the High Court in order to hold them responsible for the unauthorized file-sharing of their customers. The evidence of subscriber infringement on sites such as The Pirate Bay is now considered enough to put ISPs on notice that they need to block sites to stop it. The big question now is what Weatherley envisions on the legislative front that isn’t already covered. Will ISPs be expected to warn and disconnect infringing customers in order to maintain their safe harbor? Or perhaps actively blocking a wider range of sites once wide-scale infringement is established will be acceptable? A combination of the two might seal the deal but all options are very much political hot potatoes. Time will tell, but in the meantime Weatherley signs off with a note to the industry. “The creative sector needs to show greater flexibility and to be part of the solution,” he concludes.